How do you think about treats, and is it healthy? Opinion: Halloween is an opportunity to offload my rant about what constitutes a treat, but it's an evergreen topic. The very idea that we can call these sugar and chemical-laden processed lumps ‘treats’ is the worst misnomer out there and a very dangerous one at that. With bowls of chocolate bars at every door and parties fueled by fizzy drinks and fast food, Halloween is the perfect time to consider this. How do we teach ourselves, let alone our children, what a treat really is? As a society, we have been lead to believe through the processes mass consumerism and marketing over the decades that treats come in wrappers and are loaded with sugar. And while they are convenient and often very cheap, the bitter reality is that they are highly processed and usually bad for your health. The convenience aspect is one of the draws: we rarely have the time to stop and think about the fact that all this is bad news for you, your health, your pocket and probably your mind. Wouldn’t it be amazing if we could stop this cycle of food and lifestyle-related ill-health and bad habits and set the next generation up to be empowered to make positive nutrition and lifestyle choices in a really balanced way? There’s a common misconception that ‘treats’ equate only to food. So, I stopped to think about true treats and indulgences and what they mean to me. Massages. Facials. Afternoon tea in a fancy hotel. Spending time with loved ones. Making things for other people. Creating things. Time to do something you love for yourself. These are all good for me and my health (apart from extra clotted cream, which is a sheer indulgence, 80:20 rule applies here!). Reevaluating how we reward ourselves takes a shift in perspective, but ultimately reveals how rich and enjoyable our lives already are. So, now when I make a loaf of brown bread to go with a homemade soup, I recognise this as a treat. This is how to show love to those sharing it with you and to yourself. You deserve it. Your body deserves it. It is a treat for your body and soul. As is the cake you might bake for a random occasion outside of birthdays. As are ice pops you make from fresh fruit. As are slices of watermelon from the fridge on a hot summer’s day. And all of this behaviour is leading by example to your children. It’s not finger-wagging and then downing a bag of wine gums on the couch. It’s walking the walk, and maybe that’s a lovely country walk. Western parents notoriously find it difficult to say "No" to our children, which may make cracking these habits feel daunting. Involving your kids in the process is the best starting point to making positive change for all the family. It’s not always going to work, and it’s likely to be a gradual change but it’s worth it. If they adore burger joints, why not prepare homemade burgers and chips together at home. Their pride in creating their own favourite dinner will support what you are trying to achieve. As you progress, let them help you choose the meals for the week. Let them choose any vegetable they’d like to taste, whether it be weird and wonderful or a weekly staple. You’re encouraging them to think more about their food and letting them know that they have the power to influence what they eat in a positive way. Outlining what constitutes a treat for you, and getting your kids to do the same can really help with a mind shift in the right direction. It’s so important for kids to break down the idea of junk food as a treat, but then also making sure they recognise what real treats are for them. It’s also card up your sleeve for moments when they are hounding you for junk food that you don’t want to give them. You can offer them something that they have already decided is a real treat for them. Giving them options is a great way to help them make better choices, empowering them with ownership and responsibility. Do you want to go for a walk with your cousins or would you like to help me make your favourite dinner? If you can help me to plan the meals for the week ahead, we’ll have time to have your friends over to play on Friday. You do this already, but putting a structure in place allows you to feel more in control and helps you stay on track with what you are trying to achieve. I can’t bring myself not to have junk food for the passing kids, but I still give a mandarin for their bag that we’ll have decorated like a baby pumpkin. You can’t avoid the deluge of junk food at this time of year. 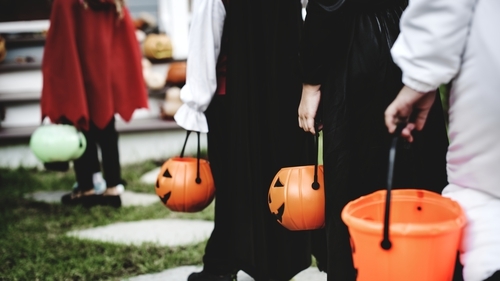 So, to minimize the onslaught, before they even go out on their trick or treating rounds, why not enthusiastically suggest they pick the top 10 items they get and they can keep them in the kitchen to eat over the next week or two. Make the deal in advance, though! Now, I’m not trying to lay the guilt on for buying that ice cream, or cooling down with a soft drink, or plucking for fast food because it gives you a night off cooking and the kids get a cheap, horrendous toy that keeps them happy for 20 minutes. I’m just saying, to me, that’s not a treat. It's time we challenge the use of that word and only assign it to things that, to us, feel like a treat. Maybe the answer is in not buying so much ‘stuff’ but appreciating the simple things in life as the treat. If it’s not something Leonard Cohen would sing about, then maybe it shouldn't count as a real indulgence. Tea and oranges on the other hand, now there’s a treat! And it’s nice that you took the time to hear me out. In fact, writing this was a treat!